Ethernet/internet-based data monitoring brings new capabilities and unprecedented access to process and temperature measurement and control. Using standard process or temperature sensors, such as thermocouples or RTDs (temperature), pressure transducers, flowmeters or other sensors that produce a standard analog or pulse output, you can monitor, control or log data in almost any location - across the hall, on the other side of the street, across town, on opposite ends of the country, or anywhere around the world. To give you an idea of the capabilities of these devices, consider the following application: monitoring the environment in a corporate warehouse. You need to monitor (and log) the temperature, humidity, maybe even the security. Thanks to stand-alone units such as the iSD-TH with built-in sensors, you can monitor remotely temperature, humidity, even dew point, without needing anyone on-site. Two contact closures work with common alarm sensors, so you can be alerted if a door is opened, a window broken, or a fire sprinkler going off. The iSD-TH can send an e-mail to you, as well as to a distribution list; it can also send a text message to your cell phone. If you have an IP camera or web cam, you can view the scene right on your computer. Depending on your specific application, you can monitor remote ambient temperature, humidity, dew point, barometric pressure and/or gas pressure (clean, dry, non-corrosive gases), or use a thermocouple or other process (pressure, flow, etc.) sensor with analog voltage/current or pulse output, and make the data available anywhere on your Ethernet-based network. 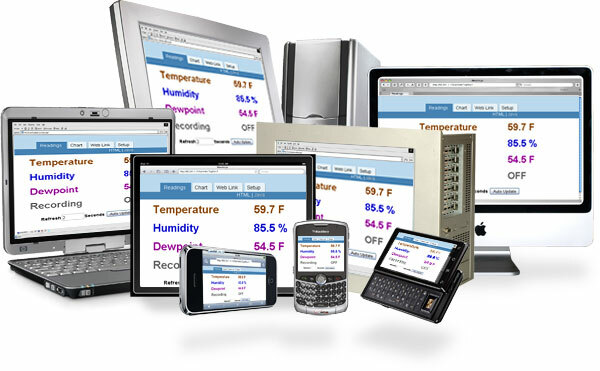 The iServer can be configured quickly and easily using either a web browser from any computer on the network or the iConnect software for Windows (available free from Omega's web site) making remote temperature measurement easy. You can even use a terminal emulator program if you want to. iSD-TH: compact, wall-mount unit for local humidity/temperature monitoring. Features a large LCD display with real-time clock, webcam/IP Camera link (available separately), SD card flash memory storage with remote retrieval, two contact closure inputs for alarm or other monitoring, two alarm relays. iSD-TC: similar to the iSD-TH, this unit accepts two thermocouple inputs for remote temperature monitoring. Features a large LCD display with real-time clock, webcam/IP Camera link (available separately), SD card flash memory storage with remote retrieval, two contact closure inputs, two alarm relays. UWTC, UWRTD, UWRH, and UWIR: thermocouple, RTD, humidity/temperature and non-contact (infrared) temperature sensors/transmitters. Capable of distances to 120 m (400 ft). Omega also provides additional software tools to make your job easier. If you need to log data to your local PC, iLog software for Windows grabs the data and logs it to an Excel spreadsheet. Analyze your data, chart it, or export it to another format for later analysis. Mail Notifier works with Microsoft Outlook to configure alarms, and send an email or text message when an alarm condition occurs. iFlash is a Windows-based utility that allows users to retrieve data stored in the iServer on a flash memory card (specific models only). The iPort program redirects a local serial (COM) port on a PC to an iServer MicroServer on an Ethernet network.